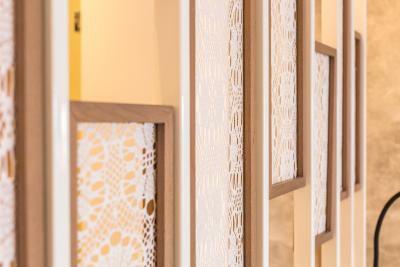 Lock in a great price for Oia Suites – rated 9.5 by recent guests! 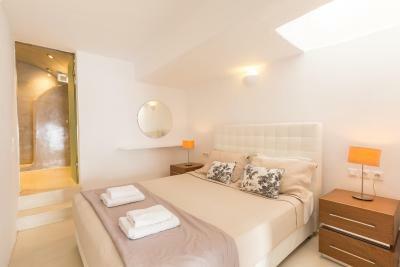 Very good location in the quiet village of Finika, a pleasant 10 mins walk from Oia city center along the hiking trail. Bus stop to Fira just at the door step. Some amazing restaurants nearby, be sure to try Meze Meze and the legandary Santorini Mou. Fantastic room with hot tub, unbelievable view. All you wanted for breakfast & very good. Maria & Sophia were wonderful. Small & more intimate than most larger places. Only 8 units so each were large @ no crowding at the pool. Maria and her staff went out of their way with friendly greetings and assited us with all our requests. They are very customer focused and always wanted to make sure we were comfortable and if we needed anything. I highly recommend Oia Suites. Maria and Sophia are wonderful. From check in to check out they helped us in each and every way. Best thing was when we had to check out before the Breakfast timings..they went out of the way and made us breakfast which was served in the room. The property itself was beautiful and the view from the room is just Incredible. What a lovely spot! On the caldera, warm staff, beautiful room! I would come back anytime! Great service from staff , good location to walk to oia centre. The Staff was very friendly, accommodating, they went above and beyond! The location was only 10 minutes walk to centre of Oia which was perfect giving us a peaceful and quiet location, the view was amazing! 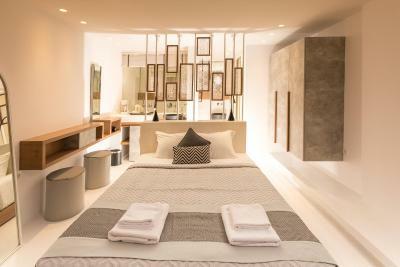 We recommend it to anyone going to Santorini, we definitely would stay there again. 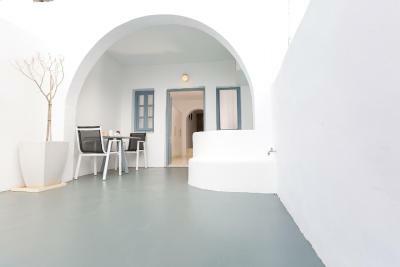 The location was beautiful, close to Oia but with a little more privacy. The staff was amazing, friendly, helpful, and attentive. Whatever you needed, they took care of. Sunsets were beautiful and you're on the hiking path between Oia and Thira. 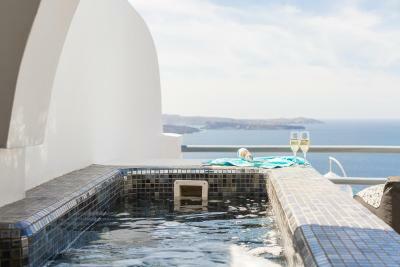 Oia Suites are located in the outskirts of the scenic village of Oia. 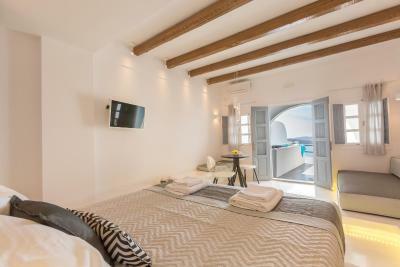 It offers free parking, free wireless internet and breathtaking views of the volcanic islets and the famous Santorini cliffs. 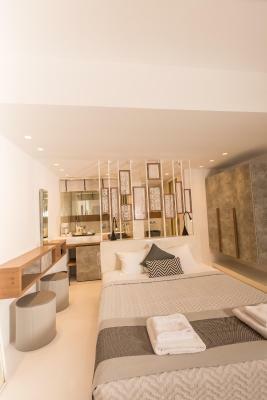 The Cycladic-style complex offers spacious minimally decorated accommodations, some with kitchenette facilities. They are equipped with LCD TV and air conditioning. 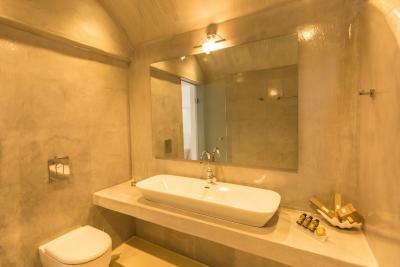 Each suite has a private bathroom and balcony. 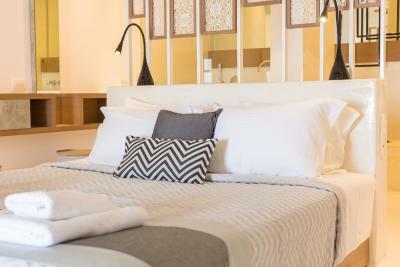 Oia Suites provide daily room cleaning service. 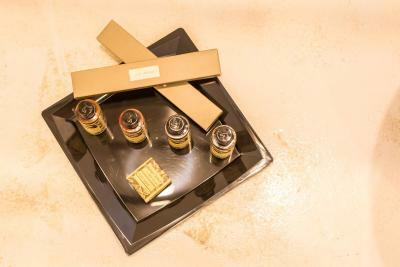 A mini-bar with free water is provided upon arrival. Cars and bikes are available for rental and information on excursions is provided. Athinios port is a 20-minute drive away. 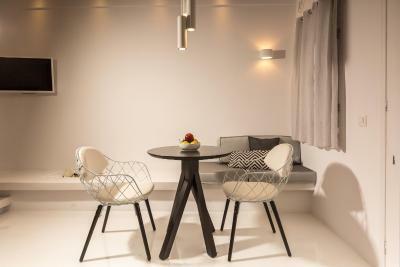 When would you like to stay at Oia Suites? 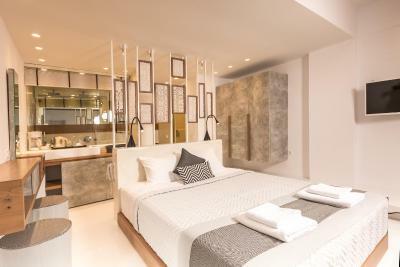 Featuring a TV, this traditionally styled suite comes with a separate bedroom and a private bathroom. Its balconies face the volcano, caldera and the sunset. A mini-bar with free water is provided upon arrival. 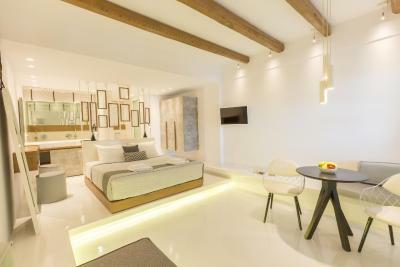 Romantic suite with private balcony with view over the volcano, sunset and caldera and the sparkling Aegean Sea. A mini-bar with free water is provided upon arrival. 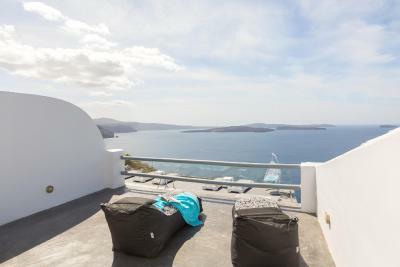 Features balcony overlooking the volcano, the sunset, the caldera and the Aegean Sea. It has a seating area and bedroom. 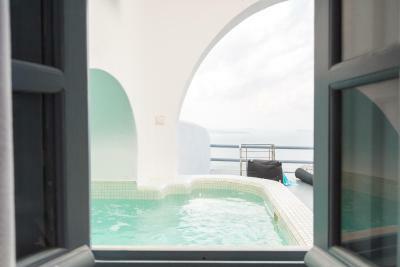 Includes outdoor hydromassage tub with sea - caldera view. A mini-bar with free water is provided upon arrival. 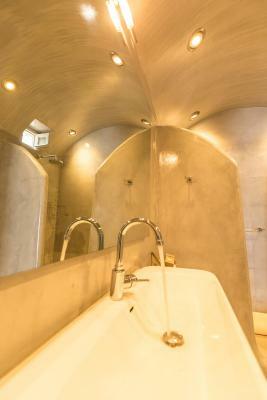 Features built-in, outdoor, large hydromassage tub with direct caldera and sea views. 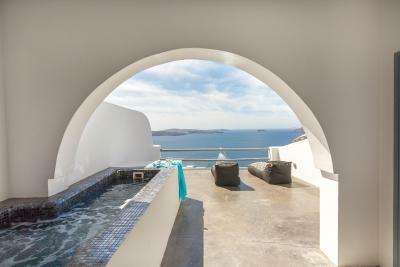 It has a private balcony overlooking the volcano, sunset, the caldera and the Aegean Sea. Includes a spacious seating area and bedroom. 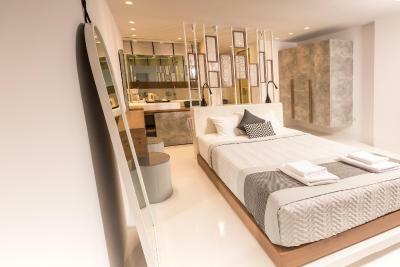 With a combination of luxury and minimal design, this modern Suite features an outdoor, built-in hydro-massage tub with direct caldera and sea views. 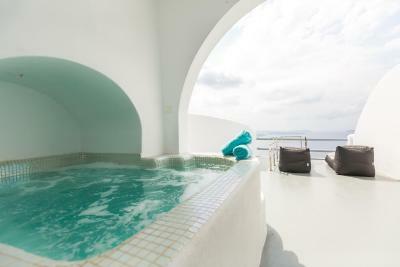 It has a private balcony overlooking the volcano, sunset, the caldera and the Aegean Sea. Includes a seating area-bedroom. 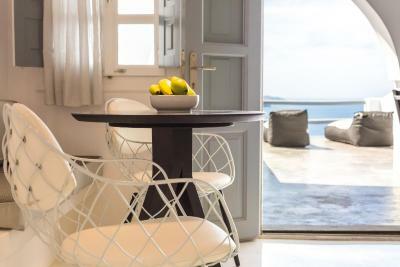 House Rules Oia Suites takes special requests – add in the next step! Oia Suites accepts these cards and reserves the right to temporarily hold an amount prior to arrival. Beautiful hotel, 10 minutes walk from Oía town. Amazingly polite and helpful staff. Spotless room and facilities. Filling complimentary breakfast. We arrived late due to delay and they made sure our transfer met us on time and had food and drinks ready in our room. Outstanding views. We will definitely stay here again. 1) Past reviews were rather misleading when it came to the interior of the standard suite. 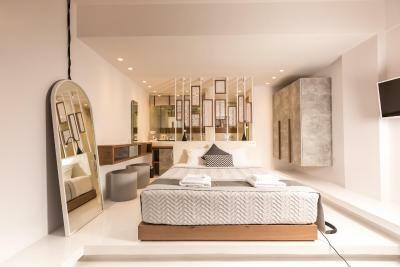 There is certainly lots of space (except the small bathroom) but the quality of design and furnishings is quite basic and of a much lower standard than the exterior. The bed was not very comfortable. 2) In addition the room was cold when we arrived and clearly had not been aired and warmed up properly. 3) Breakfast was fairly good but a little disappointing considering the room rate. 1) Staff are all very pleasant and helpful - especially good restaurant recommendations from the younger lady at reception. 2) Public areas are beautifully designed and well kept. 3) Impressive view. Everything was beyond perfect. We were treated like kings and queens while on our honeymoon. Breakfast was served to our private terrace. 15 minute walk to the heart of Oia. 2 minute walk to the most secluded beautiful spot for the sunset. We can’t wait to visit again! Oia Suites is a 10/10! The staff were amazing and so helpful with organising tours and things to do in the local area. We arrived on a late flight (12:30am) and they helped us organise a transfer that dropped us right to our door and left us welcome drinks and snacks in our room. Every morning breakfast is deliverd to your door and you can sit on the balcony enjoying the view. We booked one of the rooms off the main pool that had a private hot tub and it was incredible and super private! The walk to Oia town isn’t far at all and to be honest it was lovely being out of the hussle and bustle of the tour boats and people in Oia. Highly recommend Oia suites, it was pure luxury! A stunning outlook, quiet and clean. Really friendly helpful staff. Close to a taverna for meals. The room was very comfortable and the view spectacular. Staff were great and an overall fantastic place to enjoy this beautiful island. 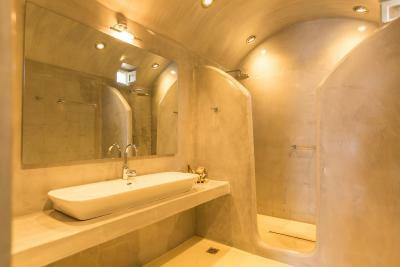 The bathroom is big with huge vanity, plenty of space and double shower. Beware! 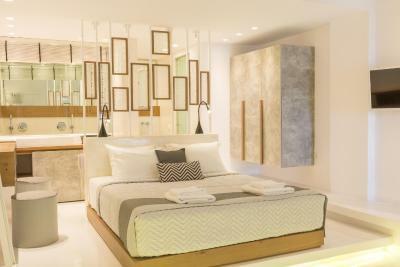 If you are planning to go for their Room type - Suite with Sea view, then let me tell you the truth. Their Sea View Room details as shown in the screenshot in my comments says that they have a balcony, which the room does not have. The room has a porch which has a sea view. This room was definately a trip spolier for us. We paid approx 200 euros for this room with lot of expectations. When we reached the place, we were really not happy with the room as we felt that the room description was misleading and the actual room was of much lesser quality than shown in the pictures. Their staff and the manager were not accepting their mistake that what they were doing to get customers by showing wrong room info was cheating. Regarding the location, this room is at a distance from Oia so you need to walk up a bit. Please dont get surprised if they serve you cold water in the name of a welcome drink. The list goes on like they have bad doors, etc In the end, I would say that if you want to say in Oia, look for a better place. There are many hotels there. An absolute NO to this place. I hope my reviews savs some one elses trip from getting ruined. Thanks. Staff were really helpful and friendly. Always there to answer any questions and also offered us tips on what to do around the island. The hotel is situated just outside all the hussle and bustle of the centre of Oia, which we preferred and its only a 10 minute walk away. 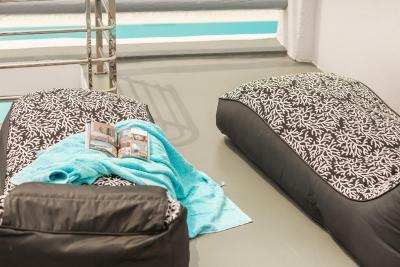 The room was huge, clean and super confortable, the pool and it's surrounding area just gorgeous. The sights from the terrace absolutely stunning and the location just perfect: away from the noisy center but just 5 minutes walking from Oia busy paths. But the best was the amazing people that runs the place, Maria and Sofia are two wonderful and amazing hostesses that did everything to make the experience even more enjoyable!! Thank you very much for a magical stay!! !